Every great city has its high point. There are towers, like the Eiffel of Paris or Dubai’s Burj. There are tall buildings, like New York’s Empire State or Melbourne’s Eureka. Then there are mountains like Rio’s Corcorvado or Capetown’s Table. 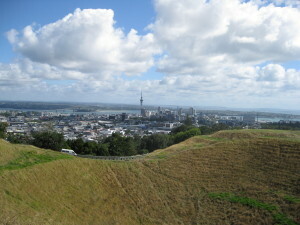 New Zealand’s Auckland or Tamaki Makaurau, boasts two high points – the giant syringe, known as the Sky Tower and Maunga Whau, or Mount Eden. The tallest of Tamaki Makaurau’s 48 extinct volcanoes, Maunga Whau offers a 360 view of the region, from east to west coast, over the sea to north, away across the plains to the south and all around its 47 sister cones. Terraces on its slopes mark the site of the Pa or fortified village which stood here in ancient times. As enemies could be seen approaching from great distances and from any direction it was virtually unassailable. Consequently, the Tangata Whenua, or people of the land here enjoyed a position of some superiority and power. Whau in Te Reo Maori, or the Maori language means tree or wood and Maunga Whau is home to some magnificent pohutukawa and totara tree which probably date back to the time of our Maori ancestors. Today Maunga Whau belongs to all the people of Aotearoa New Zealand. They jog, cycle, tramp, stroll, picnic, celebrate, take time out and sell crafts and souvenirs here. Messages of love and proposals of marriage are spelt out in volcanic stones, in the clearings between clumps of flax and stands of trees on the grassy, undulating terraces. The lower slopes are given over to a government farm and sheep graze in lush green paddocks. Just below Maunga Whau is the port of Auckland, named Te Herenga Waka or the mooring place of canoes, by the Tangata Whenua, because of the hosts of waka or canoes that anchored on their voyages up and down the islands of Aotearoa. Now giant cruise ships lie at anchor in Te Herenga Waka. Out beyond it on Auckland’s twin harbours, the Manukau and the Waitemata, some 135 yachts and launches ply the waves. Today, Auckland, as well as the mooring place of the canoes, is also the “city of sails”. 60,500 of the country’s 149,900 registered yachtsmen come from the Auckland Region and its Westhaven Marina is the largest in the Southern Hemisphere. Even if they’re not boaties, Aucklanders are sea creatures. They head for the water at every spare moment. Most inner city suburbs have their beach or their bay and no point in greater Auckland is more than thirty minutes from the sea. You can walk from one side of the city to the other, without once losing sight of it. From Maunga Whau, the two harbours, Manukau to the West and Waitemata to the East, seem to wrap like blue silk around the green, hilly landscape. Green spaces and trees are closely kept here in Auckland. And away from Maunga Whau on all sides roll houses in gardens with lawns and trees. The lush acres and spreading trees of the Auckland Domain press in against the city on one side. The sea wraps around the others. The CBD is small with modest towers and high rise. Only the Sky Tower rises up to jab the clouds like a huge hypodermic needle. The architectural standout in the Auckland landscape, from any point, is the War Memorial Museum which sits in the domain on the edge of Auckland’s smallest crater. For bird’s eye view of Auckland and the get the lie of the land Maunga Whau take a trip to the top of Maunga Whau.